We made it into Newcastle in the afternoon and headed to our couch-surfing hosts' place. We were a bit surprised at how trusting Julie and Cameron were. We had never met and only had a quick chat online, but they left a key for us because they were at work. We enjoyed a great dinner with them and a few of their friends, Cameron's a great cook! Their dog Sasha accompanied me on my morning vocal exercises the next morning. The venue The Royal Exchange is a micro-theatre that has been in operation in the central business district for over 15 years and is run by an interesting fellow named Dean Winter who reminded us a bit of Frank Zappa and is obviously an asset to the community. 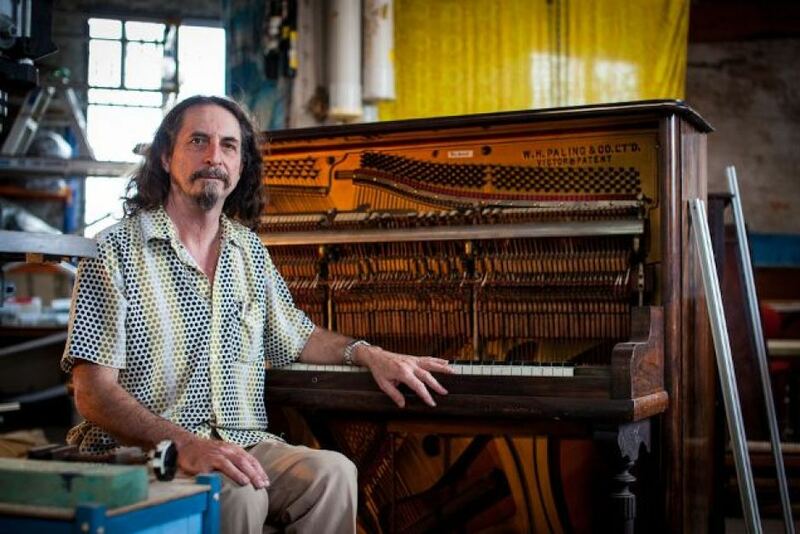 I found a news story about a program he and his son initiated to put pianos in various places around the city for anyone to use. (photo: ABC news Jackie Lampe) He's been involved with theater all his life and his venue shows it. It was one of the most unique places I've performed and quite a comfortable space.